click: Reveal the top 4 cards of your stack. If any of those cards are programs, you may add 1 to your grip. Add the rest of the cards to the bottom of your stack in any order. If Levy Advanced Research Lab reveals a program, can the Runner add a non-program from among the revealed cards to the grip? 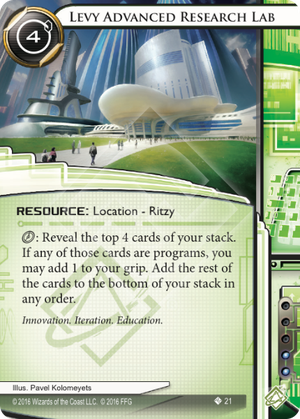 If Levy Advanced Research Lab does not reveal any programs, or if the Runner chooses not to take any revealed programs, do the revealed cards still get added to the bottom of the stack? Levi Advanced Research Lab (LARL) is a semi-tutor for programs. It works like this: every time you pay a you and the corp see the top 4 cards of your deck. If the program you're looking for is in in there you add it to your grip. All other cards go to the bottom of your deck in any order. Because of the cost of LARL (4 and a bunch of clicks) it's only useful for situations where you absolutely need a program soon. However shapers already have quite a good tool for that: Self-modifying Code. SMC has the benefit of being 2 cheaper if you only need to find one program (LARL is reusable) and working during runs, even when you facecheck ice. LARL needs to be used before you run but doesn't take up 2. Because the cards to go the bottom in any order LARL combines well with Window. That combo adds so much value I would always include Window in a deck that uses LARL. Among other things it helps you with one big downside of LARL: moving cards that you really want to draw to the bottom of your deck. LARL in turn makes Window more reliable by letting you have some control over what's on the bottom of your deck. I don't expect LARL to see much play in shaper since in most cases Self-modifying Code will do the job cheaper and with more flexibility. LARL only costs 2 influence so it could be imported by other factions, but Special Order is 2 influence too and cheaper if you just want an icebreaker. Perhaps there's some really good combo to be made using the cycle-your-stack effect, but I don't see it yet.